We all, at one time or another, have taken a picture of a wine label, but yet we never remember what we had with that wine, who we shared it with or where we were. myFabWines is much more than simply taking a picture of the label - it is about capturing and remembering your wine moments. Those moments where you share a bottle of wine with friends or your sweetie - over a meal at home or at a nice restaurant or just relaxing and savouring a bold red or a crisp white. 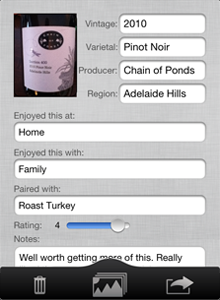 Along with the picture of the label; add info about the wine, the meal, the venue, your guest(s), the location and your thoughts of the wine, the food paring or the moment itself; save it to Evernote; share on Facebook and Twitter. It is that simple! You will always remember your wine moments with myFabWines. Use the camera to capture the label or select it from the Photo Roll. Enter the wine details - vintage, varietal, producer, region; who you were with, where you were and what it was paired with; rate the experience on a scale of 1 - 5; and add any notes on whatever made this moment special. 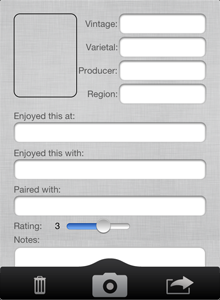 Wine moments are nicely formatted and saved in a myFabWines notebook in your Evernote account. 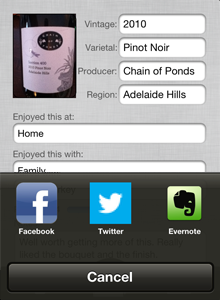 Each moment is geo-tagged so with Evernote Atlas you can see the geo-location of where you enjoyed your wines. 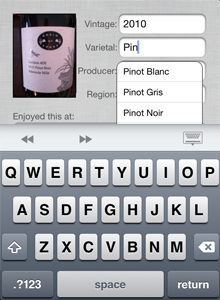 Then use Evernote on any device, wherever you are, to search for a particular varietal or vintage or a specific pairing. We love to share special moments with our friends through Facebook and Twitter. 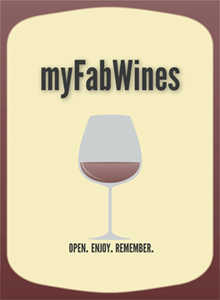 myFabWines automatically formats your post and tweet. Change the message if you wish and then upload to Facebook and Twitter. Two-clicks and your friends will know about your latest wine moment. Copyright © 2019 myFabWines - Remember your wine moments! Web site powered by WordPress 3.9.27 and Gorgon WordPress theme designed by FabThemes.com.